It’s unfortunate but true, that out of all the things that college teaches you, winning money habits are not among them. If you are a recent college graduate, it’s almost certain that you’ll have to learn money management for the first time in your life. Sure, you learned a few things about money during your school years – mostly living without it. But it’s a big difference when you have a paycheck that needs to be allocated, and all kinds of expenses pulling at you from all different directions. It can be confusing, and if handled incorrectly, it can set you up for poor money habits later in life. 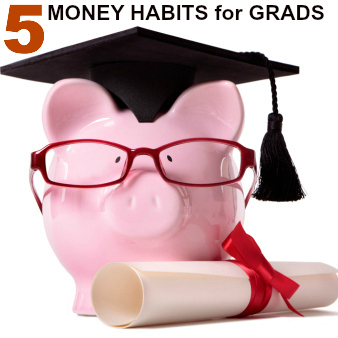 If you are a recent college graduate, what can you do to adopt winning money habits now? Here are some excellent ideas. 1. Embrace a low-cost lifestyle. You undoubtedly learned the art of living on less while you were in school, but now is no time to abandon that strategy. Many college students – thoroughly tired of living on a shoestring – begin spending money with reckless abandon upon landing their first full-time job. This is a mistake, not only because it can cause you to spend money you don’t have, but also because it can cause you to increase your expectations in life. High expectations cost a lot of money! The most basic strategy for financial success in life is to spend less than you earn, and invest the difference. Over time, that strategy is almost guaranteed to make you rich. But in order to get there, you have to keep your expenses low. Live in the least expensive housing you can, drive the cheapest car possible, learn to cook and eat your meals at home, and do whatever it takes to avoid spending sprees. If you are a recent college graduate, it’s very likely to you are already carrying a significant amount of debt in the form of student loans and even credit cards. It should go without saying that you should have a workable plan and the tools you need to pay those off as soon as possible. But beyond paying off school-related debt, it is essential that you avoid replacing it with new debt. The less debt you have, the lower your cost of living will be, and the more money that you will have to save and invest. No matter what challenges you are facing in life – financial or otherwise – they will always be easier to handle when you have a few thousand dollars sitting in the bank. This is one of the primary purposes of living a low-cost lifestyle and not borrowing money. You want to make sure that there’s room in your budget to build your savings on a steady basis. An emergency fund will not only protect you from unexpected expenses, but it will also be a ready cash reserve in the event you lose your job. Never underestimate this possibility, no matter how secure you may feel in your job at the moment. An unemployment check, supplemented by extra money drawn from an emergency fund, can carry you through a period of unemployment. But you have to have the money saved up in order for that to happen. 4. Start saving for retirement – even if it’s just a little bit. On the surface, it can seem almost absurd start saving for retirement when you’re in your 20s. But as any retirement projection will show, the sooner in life you begin saving money, the more money that you will accumulate – and the sooner you will be able to retire. There’s another important reason why you want to begin saving for retirement now. You need to establish the retirement savings habit now, so that it will be a regular part of your routine going forward. The more money that you save early in life, the more options that you will have later on. Don’t fret if you don’t have a lot of money to save – after all, you have other obligations right now, such as paying off school debts and building up emergency savings. But even saving $100 or $200 per month for retirement will start making a difference in just a few years, especially if you have an employer match in your company savings plan. No amount of money is too small to save on a regular basis. As time goes by, you can begin to increase your contributions as your financial situation improves. But that will only happen if you make saving for retirement a habit, and the time to do that is now. 5. Buy second-hand whenever possible. There’s no doubt about it, college graduates have a lot of needs upon entering the adult world. There is a car to buy, and apartment to furnish, clothing, and even business equipment that you’ll need. All that will cost money – but you can make sure that doesn’t cost so much. Buying secondhand will be your best friend. Start by buying a used car. Ideally, your car should cost no more than what you can pay without taking a loan. And if you have student loan debts to pay, the last thing you need to be doing is adding a car payment to the mix. Buy the best car that you can with the cash you have available, then plan on trading up every couple of years as your income and savings grow. The same is true of home furnishings. Sure, we all like to have new stuff, but when you’re on a budget you have to make sacrifices. You can generally buy secondhand furniture for pennies on the dollar. And you should – after all, furniture is quite possibly the worst “investment” you can make. Buy secondhand wherever you can – clothing, entertainment equipment, and maybe even a used computer if you can find a good one. You can save thousands of dollars this way, and that will also help you to avoid the temptation to use your credit card. It’s important to remember – especially when you graduate school – that this is a time to build habits, good habits! That’s critically important when it comes to finances. The habits and patterns you develop now will be with you for the rest of your life. See them for the long-term choices that they truly are. What are some other winning money habits you think you should put in place? Leave a comment!